Any person wishing to sell or rent a property in Spain must have a valid Energy Performance Certificate. The certificate contains information on the orientation, structure, energy and lighting systems of the property and to what extent it conforms to current energy classifications, with an energy classification from A (most efficient) to G (least efficient). The Certificate is valid for 10 years, although if substantial changes are made to a property, the Certificate must be updated. This could include changing the windows or the heating system. For those who do not have a valid certificate when selling or renting a property, they may pay a fine of between 300€ and 600€. The first necessary step is a first meeting with us to visit your home. From there, we take care of all the paperwork until you hand over the Energy Efficiency Certificate duly registered in the corresponding autonomous community. Please note that the registration of the certificate is essential for the certificate to be valid. Visit the house to collect the data and information necessary to carry out the Energy Certificate. Analysis of the façade materials, as well as the heating and air conditioning installations. Obtaining the Energy Certificate. 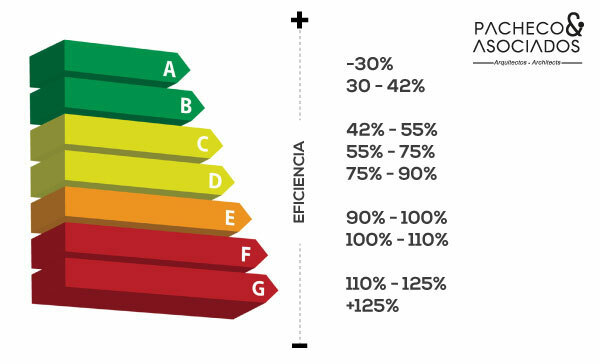 With the results of the calculation, the Energy Efficiency Certificate is generated with its subsequent label. This qualifies the energy efficiency of the home from the letter "A" to the "G", with "A" being the best result and "G" the least efficient. Drafting the full report where we will interpret the whole process and how to analyse the data. In addition, we will include a comparison of a series of measures, evaluating the most efficient option from the economic and energy point of view to improve the rating of the home. Energy property registration. Finally, the certificate must be registered in the Autonomous Region where the house is located. This body will issue the official energy label, which should be used to inform potential buyers or tenants of the property. The payment of the fee for this procedure is included in our fees. How much does it cost to obtain an Energy Efficiency Certificate?